You may be getting ready to buy yourself a massage chair? Great idea if so! Though lets face it, the massage chair market is progressive. Right now it is packed full of chairs to choose from and it can be a challenge to see through all the options available. This page will help you to find your way to which chair is the most viable for you where to begin with, its important to get your specific needs met. Our information below will support you to do just that! This review focuses on making it easier for you to get to the facts in regards to this specific chair, that we think is well worth a look at. The Kahuna LM 7800 is often quoted as ‘The Best Performance Kahuna Massage Chair'. It may be possible for you to see why this has been said as we break it down in each menu section. So lets take a deeper look at the features, the specs, the pros, the cons and more as well as including what customers that already use this chair are saying. Are There Any Problems With The Kahuna LM 7800 Model? The Kahuna LM 7800 is a professional quality and deep tissue massage chair. One of its signature features is that it's been cleverly designed by specialist therapists of shiatsu massage. This technology applied to the chair not only gives it the authentic feel of an actual shiatsu massage given by hand but it also means real therapeutic results. Shiatsu, a Japanese healing art therapy translates to “finger pressure” as stronger finger pressure applied to specific points on the body provides accurate health benefits. This chair's programs uses finger pressure, tapping, kneading, rolling and a twist function. It has 36 air bags from head to toe providing an all in one full massage for your whole body. The pressure from these bags directly assists the airbags to be capable of a strong shiatsu performance experience. To assist the deep tissue nature of the massage this chair gives it comes with three flexible massage strength level and speeds to choose from. It has four top quality fully automatic massage programs and three different reclining positions. There are both automatic and manual program options provided so you can customize each massage to get exactly what you want. The options include five different portions of the body, so you can choose an all over body massage or separate your massage out and focus one by one on different parts of your body. What you may want can depend on your current level of pain, any desired objective for tired muscles and or your current mood on the day. This feature, the L-track system is a classic amongst massage chair designs, allowing massages to reach from up on the shoulder all the way down to the thighs, prvoiding additonal support in the neck, lumbar and shoulder areas as well as increasing the overall surface area of the massage for greater effectiveness. The system also uses the massage rollers to target the spine's individuals discs, allowing nutrients to flow freely throughout the spine, improving the back's overall health. The Kahuna LM7800 has massage head rollers that move along a 42-inch long massage track where it forms an “L” shape through the seat of the chair and under the buttocks and thighs. Most L-track massage chairs range from 42 to 51-inches long, making the LM7800 one of the shorter L-tracks, however its other features does compensate for its short massage track. Also another feature amongst the elite massage chairs, this computer body scanning technology uses the massage rollers to glide up the user's back, map their shape, including the curvature of one's spine as well as the hiehgt of their shoulders, and then begins to adjust the massage accordingly during a user's first massage. This feature makes it so it directly targets the shape of your body, giving you a massage that you will like seeing as though without the feature, the massage chair would be just estimating and using pre-programmed routines. The massage rollers were therefore hit all the pressure points in the user's body, allowing for an even stronger, relaxing and effective massage experience that is catered to their needs. Applying principles used by NASA, this feature works when the massage chair is reclined back, raising the user's legs above their heart into a neutral position, allowing for their joints and spine to easily decompress which in turn, relaxes all the surrounding muscles. Feelings of weightlessness can be felt, overall improving relaxation and the massage experience. Another added benefit of zero gravity is the focusing of one's body weight on the backrest, improving the penetration and effectiveness of the massage chair's techniques and automatic programs. 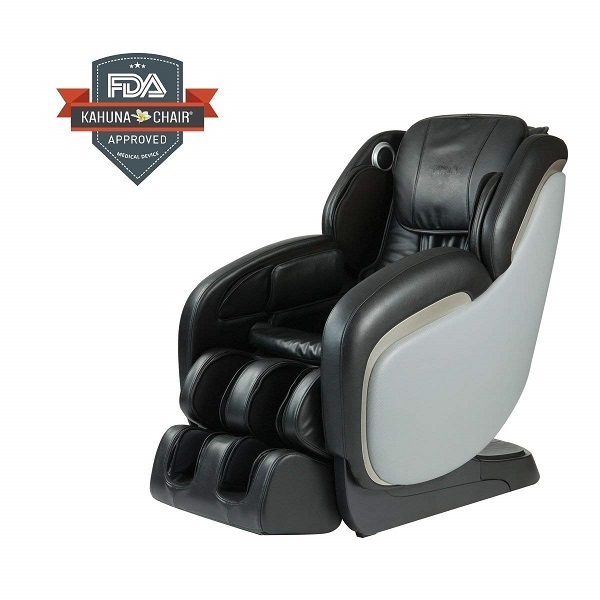 Customization is also evident in which the Kahuna LM-7800 offers three states of zero gravity, customizing your position and the massage program itself for a more suited and comfortable massage experience. Heat is crucial to any massage experience, where heating sections built inside the lower lumbar area of the backrest provide feelings of warmth and relaxation to the tight muscles in one's back. Heat will loosen up knots, soreness and pain in the lower back, relieving back pain and discomfort. Heating pads have been installed in the foot and calf area, to truly provide a stress-free massage experience, increasing circulation and helping the body remove unwanted fluids from the muscles. Relaxed muscles creates a better massage experience where head rollers can truly provide with the experience of relaxation and comfort. 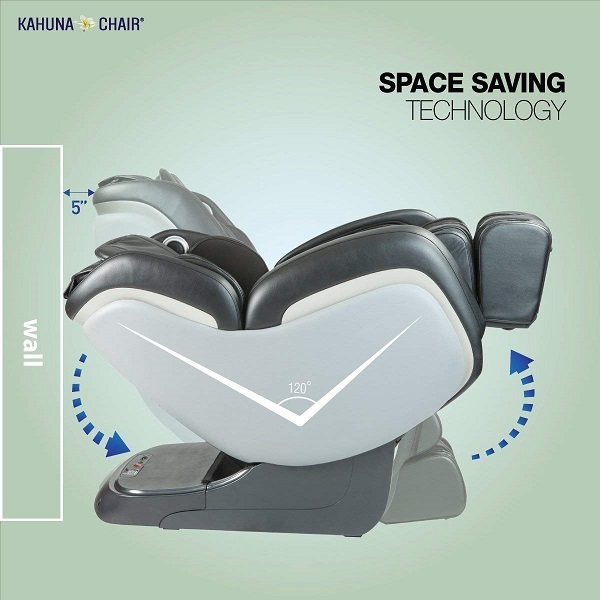 As the name suggests, the Kahuna LM-7800 only requires as little as 5 inches behind the chair to be able to fully recline into the position used in the Zero Gravity Program. Space saving technology is very efficient, sliding the base forward as the chair reclines back, ensuring the massage chair takes up as little of living space as impossible. Normal massage chairs require 15 to 30-inches of space, and with the Kahuna LM-7800, only 5 inches is needed, a much smaller and convenient amount. As part of the Kahuna Series, the LM-7800 is a relatively new product, which meant at the time of writing, there weren't exactly an aundbance in revieews or feedback but it does seem to be regarded as a reputable product with advanced features and multiple massagte techniques and programs. Based off Amazon, there were two reviews, with both rating the Kahuna LM-7800. Even if there was no exact negative feedback, we will discuss what exactly consumers wanted improved and what features need to be modified in order for it stand out as an amazing massage chair and will most certainly be a worthwhile investment to households. Considering Amazon had only positive feedback for the Kahuna LM-7800, we will only discuss the positives in which the two reviewers appreciate the rollers and that it provided a ‘deep soothing massage', the airbags provided pressure for tired muscles, the rollers relieved stress and it was easy to operate. The reviewers also liked the fact it came in piece so no assembly was required, the 5 year free warranty was an added bonus and that both reviewers claimed that they slept better after using the Kahuna LM-7800. From these two reviews it can be concluded that there were areas of satisfaction and appreciation consumers liked and there aren't exactly many negatives. As stated before, there were no negative reviews on Amazon so we cross-referenced other websites and reviews such as ChairInstitute's review where their main complaint is the heating function. They commented that while they appreciate the additional heating on the calves and feet, the fact that it is not possible to individually control the heat level from rest of heating is a let down. Another area was that they also wanted for the ‘Twist” feature to be upgraded, comparing the twist feature it with the Kahuna company's signature ‘Yoga Stretch' body feature seen in other models where it has substantially far deeper stretches. Thus, whilst there were no direct negatives or negative feedback, if these suggestions are to be resolved, the Kahuna LM-7800 can be improved to a much more convenient and worthwhile massaging investment and may even encouraged even more consumers to purchase this particular model. Are There Any Problems With The Kahuna LM 7800 ? As mentioned before, due to the nature of the Kahuna LM-7800 as a relatively new product which means minimal information, feedback and reviews, it is not exactly easy to list out the problems of this particular model, which is not to say that there aren't any potential problems or issues, it just hasn't been discovered yet. In the meantime, we will reference potential areas of improvement from other websites, such as the lack of control in the heating function, the lackluster nature of the ‘Twist” function or the fact there is no 3D massage which limits intensity or roller depth adjustments and the massage experience itself. In saying that, the Kahuna LM-7800 has no definite weaknesses or problems as of June 2018, in which there have been no reviews or feedback which tells us otherwise if there are any pressing concerns the massage chair may have, so really, it's a worthwhile product that has features well above its price range. With so many online retailers to choose from, it can be difficult making a decision. There are particular aspects you would prefer to have in your product purchasing process and sometimes, it can be fulfilled or neglected, such as security, convenience, customer service or even credibility. However, we think there is one retailer that succeeds in the provision of all four of these factors, which is Amazon. As the largest retailer in the world, used by thousands every day and millions annually, it has very tight security, and will protect you from scams, frauds and all sorts of retail troubles. As with most of the Kahuna chairs, this model is made in China. What is the recommended height range? The recommended height range for the Kahuna LM-7800 is 5'3″ to 6'0″. The chair is made from synthetic leather. With the Kahuna LM-7800, assembly is not required as it comes in a single piece. Does it have rollers for feet massage? Yes, the chair has dual foot rollers and dual rollers on the calves as well. How many airbags does it have? This model has a total of 44 airbags. Is there a maximum weight for this chair? The recommended maximum weight is 280 pounds. Does the chair have Yoga Stretch? Yes, the chair does have the yoga stretching mode. Does the chair have Zero Gravity? Yes, the model has 3 different Zero Gravity positions. Is this chair 2D or 3D? The Kahuna LM-7800 is a 2D model. The Kahuna LM-7800 only comes in Black and Ivory. Does the chair have shoulder and neck massage? Yes, the chair does have shoulder and neck massage with air cells massaging the shoulder and the rollers massaging the neck. How does the chair massage me? 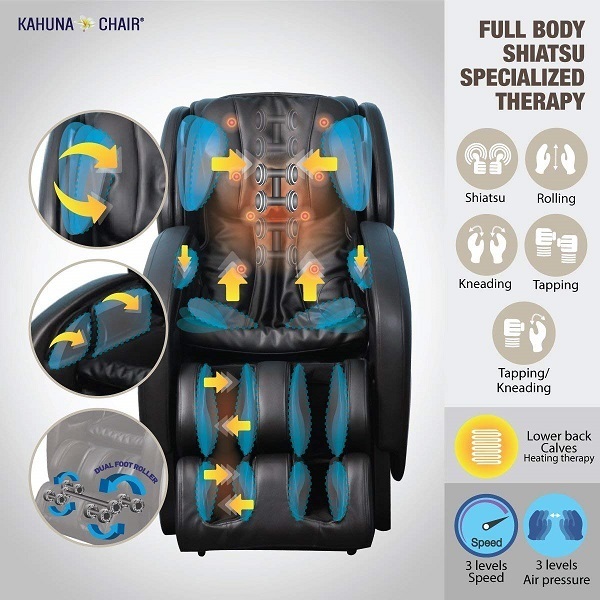 The Kahuna LM-7800 uses a combination of kneading, tapping, kneading and tapping combined, rolling and shiatsu techniques to massage its users. Does the massage chair take up a lot of space? Fortunately, the chair's space saving design makes it so that when it reclines, only 5 inches is needed to full recline where other models may need 15-20 inches. Does this chair have a warranty? Yes, the chair comes with a 5 year free warranty package, an extra 2 years compared to most massage chair packages. Conclusion – Is The Kahuna LM 7800 Worth Buying? We hope you've thoroughly read through the product review or if you just wanted to read the quick conclusion, we think the Kahuna LM-7800 is a worthwhile investment in any household. With a good amount of massage programs and massage techniques, such as Shiatsu or its clever Space Saving Design, whether or not you choose to purchase this particular model is your honest choice where hopefully we have included enough information for you to make a decision. A nicely accommodated height range of 5'3″ to 6'0″ and a maximum weight of 280 pounds, allows for greater choice and inclusion of body shapes and heights added with 36 air bags from head to toe, providing an all in one full massage for your whole body. It comes with flexible massage strengths level and speeds, top quality fully automatic massage programs and reclining positions. There are both automatic and manual options provided so you can customize each massage to get what you want depending on pain levels, any desired objective or mood. Despite its lack of color options, with Ivory and Black, lack of heat control and its state of a 2D massage chair rather than a 3D massage chair, the feedback provided shows potential and does suggest the Kahuna LM-7800 is a decently well-made massage chair that will be sure to relieve stress and provide you with massages of relief, comfort and relaxation.